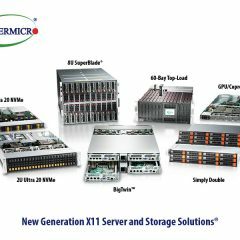 Supermicro launches the New X11 Family of Servers, Storage & Building Block Solutions, with Full Support for new Intel Xeon Scalable Processors & Breakthrough NVMe Performance. 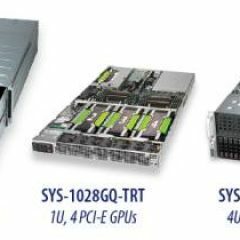 The industry’s broadest portfolio supporting the new processor family includes: 1U/2U Ultra SuperServers with best-in-class flagship performance; BigTwin™ with the highest performance and density in a 2U 4-node design with support for 24 DIMMs, six hot-swap NVMe drives and flexible networking capability for each node; 4U FatTwin™ in a variety of I/O, memory and storage combinations for most optimized cloud, HPC and Enterprise applications; SuperBlade® – 2 and 4-socket Xeon blade servers supporting 205W TDP CPU, NVMe, with integrated 100G Intel Omni-Path switch, 100G EDR InfiniBand switch, 25G/10G Ethernet switches, redundant AC/DC power supplies, and Battery Backup (BBP), making them ideal for Enterprise, Cloud, and HPC applications. Other leading products include: SuperServers with GPU/co-processors optimized for AI/Deep Learning/HPC workloads, SuperStorage solutions including 45/60-bay 4U top-loading systems with 6 built-in NVMe drives for I/O optimization, 2U Simply Double systems, 1U/2U/3U/4U general-purpose storage systems and 2U Storage Bridge Bay solutions, 2U/4U/Tower Mainstream SuperServers targeted at entry-level and volume markets for significant CAPEX/OPEX savings, 1U/2U WIO solutions with a wide-range of I/O options optimized for network or security appliances, UP servers and 4U/Tower SuperWorkstations built with server-grade components for engineering and creative professionals looking for ultimate performance and expandability on their desks. 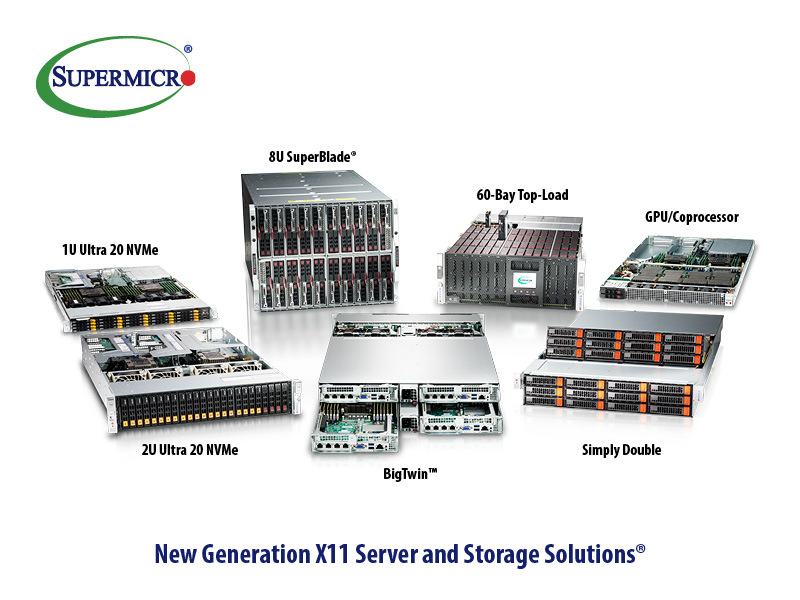 Supermicro’s new X11 generation solutions are engineered to unleash the full performance and rich feature sets on the new Intel® Xeon® Scalable processor family, supporting more cores and higher TDP envelopes of 205 watts and higher, increased to six memory channels with higher bandwidth, and more PCI-E 3.0 lanes with up to 100G/40G/25G/10G Ethernet, 100G EDR InfiniBand and integrated Intel® Omni-Path Architecture networking fabrics. 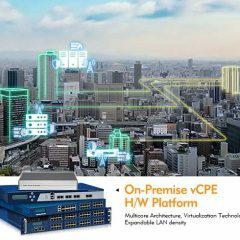 The elevated compute performance, density, I/O capacity, and efficiency are coupled with industry’s most comprehensive support for NVMe NAND Flash to deliver up to 16 million IOPS for unprecedented application responsiveness and agility. Customers can select the Server, Storage, Blade, Network, or Workstation systems optimized for their applications, as well as the performance, memory, storage, and I/O profiles that are optimally matched to their workloads, at attractive price points. Ultra SuperServer 1U/2U Offers best-in-class Enterprise level performance while delivering unparalleled value, flexibility, scalability and serviceability. Hyper-speed Ultra is specifically optimized for latency-sensitive applications. Depending on configuration, systems feature dual Intel Xeon Scalable processors (up to 28 cores, 205W TDP per CPU), 24/16 DIMMs for up to 3TB/2TB of DDR4-2666MHz Reg. ECC memory, up to 24 hot-swap NVMe (up to 16 million IOPS) or SAS3 drives, up to 8 PCI-E 3.0 expansion slots, dual or quad-port 1G, 10GBase-T, 10G SFP+, 25G SFP28 Ethernet, or integrated Intel Omni-Path fabrics and redundant 750W/1000W/1600W Titanium Level (96%+) digital power supplies. BigTwin™ 2U Delivers the highest performance and efficiency in a 2U 4-node design that supports full range of CPUs, fully exploits all memory channels with a maximum of 24 DIMMs per node, options for all-flash NVMe or hybrid NVMe/SAS3 drive bays. Depending on configuration, each node features dual Intel Xeon Scalable processors (up to 28 cores, 205W TDP per CPU), 24 DIMMs for up to 3TB of DDR4-2666MHz Reg. ECC memory, up to 6 hot-swap NVMe or SAS3 drives, up to 5 PCI-E 3.0 expansion slots including support for SIOM networking module for 100G/40G/25G/10G/1G Ethernet options and redundant 2200W/2600W Titanium Level (96%+) digital power supplies. SuperBlade 8U + 4U With up to 20 dual-socket blade servers or 10 quad-socket blade servers; 4U SuperBlade® with up to 14 dual-socket blade servers. 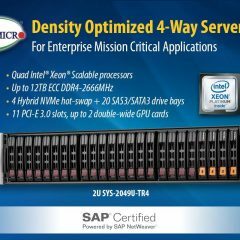 Supporting the highest performance Intel Xeon Scalable processors as well as hot-plug NVMe SSDs, both systems are designed for high-performance computing applications and Cloud applications with options for 100G EDR InfiniBand, Intel Omni-Path, or redundant 25G/10G/1G Ethernet networking support and 96% efficient redundant Titanium Level power supplies. The enclosure also has optional Battery Backup Power (BBP®) modules replacing high cost datacenter UPS systems for reliability and data protection. GPU/co-processor optimized SuperServer 1U/2U/4U Support up to 2/4/8/10 GPUs to provide maximum accelerations for AI/Deep Learning type of workloads. Configurable with up to two Intel Xeon Scalable processors (up to 28 cores, 205W TDP per CPU), 24 DIMMs for up to 3TB of DDR4-2666MHz Reg. ECC memory, up to 8 hot-swap NVMe SSDs, up to 10 PCI-E 3.0 FHFL double-width slots, or 8 SXM2 sockets with 80GB/s NVLink, dual onboard 10GBase-T Ethernet, and redundant 4000W Titanium Level (96%+) digital power supplies. SuperStorage 1U/2U/3U/4U Including Capacity Maximized 45 and 60-bay 4U Top-Loading systems, Performance and Capacity Optimized 2U Simply Double systems, Versatile and Flexible 1U/2U/3U/4U General-Purpose Storage systems and 2U Storage Bridge Bay solutions for mission-critical applications. Storage systems are configurable for up to dual Intel Xeon Scalable processors (up to 28 cores, 205W TDP per CPU), 24 DIMMs for up to 3TB of DDR4-2666MHz Reg. ECC memory, up to 48 hot-swap NVMe or SAS3 drives (via HW RAID or IT mode), 40 dual-port NVMe drives, up to 6 PCI-E 3.0 expansion slots and support for SIOM networking module for 100G/40G/25G/10G/1G Ethernet, or Intel Omni-Path options and redundant Titanium Level (96%+) digital power supplies. Supermicro Server Building Block Solutions® are architected from the ground up for the next generation data center management frameworks, including support for industry standard Redfish® RESTful APIs and Supermicro Rack Scale Design (RSD) that maximize data center utilization through disaggregating compute, network and storage resources distributed within a rack or across multiple racks. In addition, the SuperWorkstation motherboards offer 7.1 HD Audio, Thunderbolt 3.0 AOC header, up to 11 USB ports and USB 3.1 support. 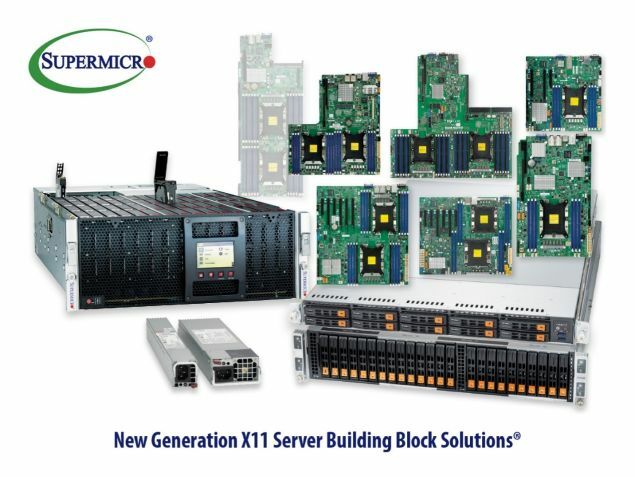 With these new generation X11 serverboard and SuperWorkstation boards, Supermicro offers the most extensive range of computing solutions for data center, enterprise, cloud, HPC, Hadoop/Big Data, AI/deep learning, storage, and embedded environments. Supermicro’s new X11 generation motherboard and chassis solutions are engineered to unleash the full performance and rich feature sets on the new Intel® Xeon® Scalable processor family, supporting more cores and higher TDP envelopes of 205 watts and higher, increased number of memory channels and higher bandwidth, more PCI-E 3.0 lanes, 100G/40G/25G/10G Ethernet, 100G EDR InfiniBand and integrated Intel® Omni-Path Architecture networking fabrics. The elevated compute performance, density, I/O capacity, and efficiency are coupled with industry’s most comprehensive support for NVMe NAND Flash and Intel® Optane™ SSDs for unprecedented application responsiveness and agility. Customers can select the Server, Storage, Network, or Workstation solutions optimized for their applications, as well as the performance, memory, storage, and I/O profiles that are optimally matched to their workloads, at attractive price points. Quad-socket server board X11QPH+ supporting 4 new Intel Xeon Scalable processors up to 205W, 28 cores, 48 DIMMs, 6TB DDR4-2666MHz with 3 UPI design to deliver 50% faster performance compared to previous generation 4-way platforms in 2U/4U. 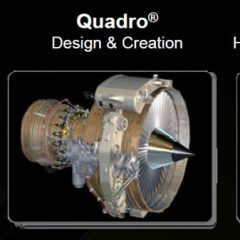 GPU/co-processor optimized SuperServer Support up to 2/4/8/10 GPUs to provide maximum accelerations for AI/Deep Learning type of workloads. Configurable with up to two Intel Xeon Scalable processors (up to 28 cores, 205W TDP per CPU), 24 DIMMs for up to 3TB of DDR4-2666MHz Reg. ECC memory, up to 8 hot-swap NVMe SSDs, up to 10 PCI-E 3.0 FHFL double-width slots, or 8 SXM2 sockets with 80GB/s NVLink, dual onboard 10GBase-T Ethernet, and redundant 4000W Titanium Level (96%+) digital power supplies. 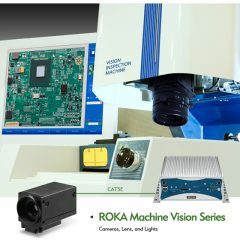 Support accessories New generation optimized chassis, power supplies and accessories. Upgraded power components and enhanced thermal designs supporting the new Intel Xeon Scalable processor family, supporting more cores and higher TDP envelopes of 205 watts and higher. Key chassis features include SAS3 12Gb/s storage, NVMe storage support, and Titanium level power supplies (96%+ efficiency). With the industry’s most optimized thermal designs, Supermicro systems provide free air cooling to help customers save tons on energy costs while helping protect our Mother Earth. 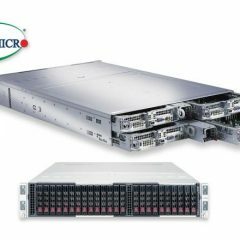 EIM E.S.C is Supermicro exclusive representative for HPC, Storage & IT.